“Turn right, here! Take a left there! Watch your speed! Have you checked your mirrors?…” These phrases may be all but familiar utterances you may have been guilty of saying while out on your teen’s driving lessons. It’s an odd phenomenon when we feel at risk to resort to backseat driving. Backseat driving may be a way for us to vent our concerns and uneasiness, but it also frustrates and intimidates a young driver. Having someone else talk while on the driving lesson can also distract your young driver. Backseat driving is rarely beneficial, even for experienced drivers. Learning to drive can be an exciting time for your student. It can also be nerve-wracking and cause frustration for both yourself and your student. Barking commands and emphasizing mistakes made will only heighten the tension, frustration and anxiety of your driver. What is the Commentary Driving Technique? Instead of making your student nervous and second-guessing themselves, and therefore undermining their good driving skills, try the commentary driving technique. With the commentary driving technique, the student makes comments about the approaching traffic situation. They also point out observations such as how fast they are going and saying what they see in their car’s mirrors. With this kind of driver’s education, the student must learn to scan the environment and make decisions based on what the approaching situation is. Students are to make their comments before getting into a situation and making a preemptive decision. These comments don’t have to be complete sentences. They can be short phrases. When your student fails to comment on an important sign or significant situation, question them as to why they didn’t say anything, what they were think about the situation and how they could have handled the situation better. After the driving lesson, discuss with your student the things they did well and ask them how they would have improved their skills and made better decisions for the mistakes they made during the driving lesson. Students can also write their thoughts down, explaining why they made the decisions they did and in what ways they can better their driving skills. Why is the Commentary Driving Technique Important? Commentary driving is a more constructive driver’s education technique that provides more benefits than the traditional commands and backseat driving techniques that parents are used to. It helps students learn to scan their surroundings. It forces students to mentally think about what they need to do in upcoming situations. It reassures parents that the student is observing and looking out for potential hazards, anticipating upcoming situations and making pre-planned decisions. It gives students more confidence in themselves and their driving skills and abilities. It empowers students by encouraging dialogue and self-assessment. It limits distractions of the driver as it should only be the driver making comments doing the talking. 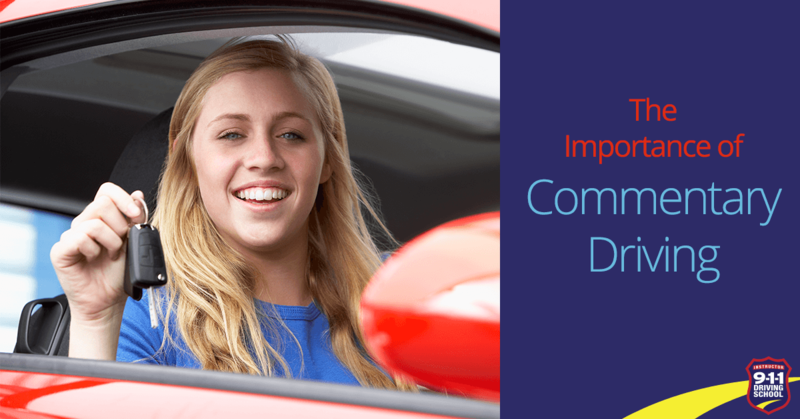 As your student progresses, you can take the commentary driving technique up a notch by introducing remarks and conversations about common distractions, traffic and road conditions on a given route. The more on-the-road drive time your student gets, the better prepared they will be in passing their driving test and getting their license. Make these lessons enjoyable and productive. The best way to do that is through the commentary driving technique. For your student to begin on-the-road driving lessons, he or she must be first enrolled in a driver’s education course at a certified, state recognized driving school. For more information about safe driving courses, contact 9-1-1 Driving School.